Amid all of the criticisms of America's war in Iraq, one essential voice has remained silent—until now. In his groundbreaking new memoir, Wiser in Battle, Lieutenant General Ricardo S. Sanchez, former commander of coalition forces in Iraq, reports back from the front lines of the global war on terror to provide a comprehensive and chilling exploration of America's historic military and foreign policy blunder. With unflinching candor, Sanchez describes the chaos on the Iraqi battlefield caused by the Bush administration's misguided command of the military, as well as his own struggle to set the coalition on the path toward victory. Sanchez illuminates the fallout of the communication breakdown between the leadership on the front and the politicians in Washington, revealing fractious discussions he had with, among others, Ambassador Paul Bremer and Defense Secretary Donald Rumsfeld. 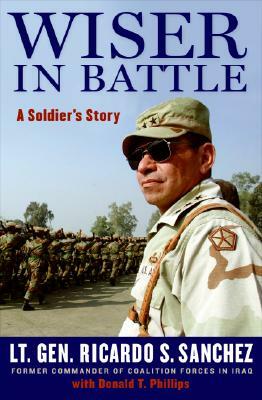 Drawing on his tenure on the ground, Sanchez shows how minor insurgent attacks grew into synchronized operations that finally ignited into a major insurgency and all-out civil war. He provides an insider's account of the Abu Ghraib prison scandal, explaining the circumstances that led to the abuses, who perpetrated them, and what the formal investigations revealed—all the while reflecting on America's objectionable use of torture and the grave need for the country's leadership to pursue an ethical course of action in the war on terror. Sanchez also details the cynical use of the Iraq War for political gain in Washington and shows how the pressure of an around-the-clock news cycle drove and distorted critical battle decisions, such as troop drawdowns, the fight for Fallujah, and the transfer of sovereignty. In addition, Sanchez shares the story of his career. He tells of the journey from his poverty-stricken youth on the Texas banks of the Rio Grande to joining the Reserve Officers' Training Corps at sixteen and later serving in Kosovo, Desert Shield and Desert Storm, and, ultimately, Iraq. At the time of his retirement, Sanchez was the highest-ranking Hispanic in the U.S. Army. The first book written by a former on-site commander in Iraq, Wiser in Battle is essential reading for all who wish to understand the current war and the American military's role in the new century. Former United States Army Lieutenant General Ricardo S. Sanchez served as commander of coalition ground forces in Iraq from June 2003 to June 2004. When he retired on November 1, 2006, Sanchez was the highest-ranking Hispanic in the U.S. Army, culminating thirty-three years of military service. He now lives in his home state of Texas. Ricardo S. Sánchez es teniente general retirado del Ejército de los Estados Unidos y sirvió como comandante de la coalición de tropas en Irak de junio de 2003 a junio de 2004. Era el hispano de mayor rango en la Armada cuando se retiró el 1ro de noviembre de 2006, culminando treinta y tres años al servicio del Ejército de los Estados Unidos. Actualmente, Sánchez vive en Texas. Donald T. Phillips is the author of twenty books, including Lincoln on Leadership. He lives in Illinois. Donald T. Phillips ha sido el autor de veinte libros, incluyendo Lincoln on Leadership, y vive en Illinois.